Now I understand that this may not be everyone’s cup of tea. People can be funny about fish and seafood and if you’ve got a shellfish allergy then I guess this is definitely a no go. I used to be one of those people who gets squeamish about seafood but I’ve had a total turn around because, quite simply, I manned up and tried it. I can’t believe what I was missing out on! 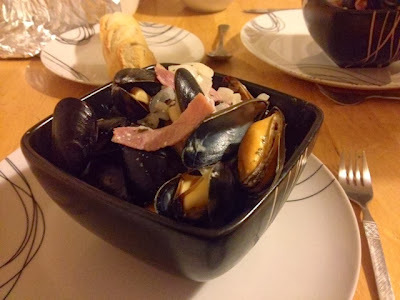 I used to think mussels were weird and ugly and why would you want to spend ages fiddling with your food picking it out of the shells when you could just order something else and put it straight in your mouth. I’ll tell you why, because they’re so damn good they’re more than worth the effort. Nowadays, put a whacking great bowl of mussels in front of me and a chunk of bread to mop up the sauce and I’ll be more than happy! Once I’d gotten round to actually eating them I wanted to learn how to cook them, and upon a little investigation I discovered it’s really really easy. People get worried about cooking shellfish properly but as long as you get your prep right and discard anything you’re slightly unsure about you’ll be absolutely fine. 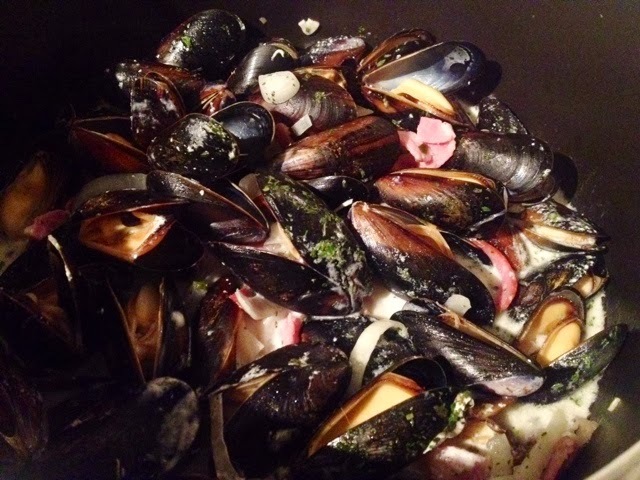 For this dish it’s best to buy your mussels fresh from a fishmonger or the fish counter in your local supermarket. They’re not expensive at all and if you go nearer the end of the day or on a Sunday you’re likely to get a real bargain as they start to reduce everything. I got 500g (enough for a large portion for two or starter sized portion for four) in Morrisons at about 12.30 on a Sunday for less than £2. Bargain. You can ask your fishmonger to clean and debeard the mussels for you. Even if you do I’d still go through them when you get home. Rinse them under a cold tap, checking them one by one. Discard any that are cracked or broken or that are already open, these are not safe to eat. Pull off any of the beard (fluffy bits) and scrape off any barnacles with a knife. Store refrigerated and eat them as soon as possible, preferably same day. Check with your fishmonger that they’ll last if you want them for the next day. Also make sure you’re heading straight home from the supermarket. Don’t leave them lying around in the boot of your car while you’re running errands all day as they’ll go bad kept unrefridgerated for so long. I cooked this dish for the boyfriend, he can be a bit fussy about seafood. 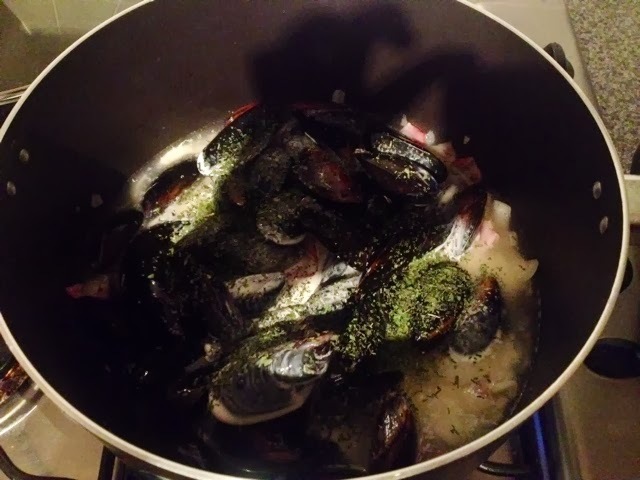 He didn’t like scallops when I made him try them and doesn’t like the tentacles on squid, but he said he’d tried mussels once before and thought they were okay, so I thought I’d give this a whirl. 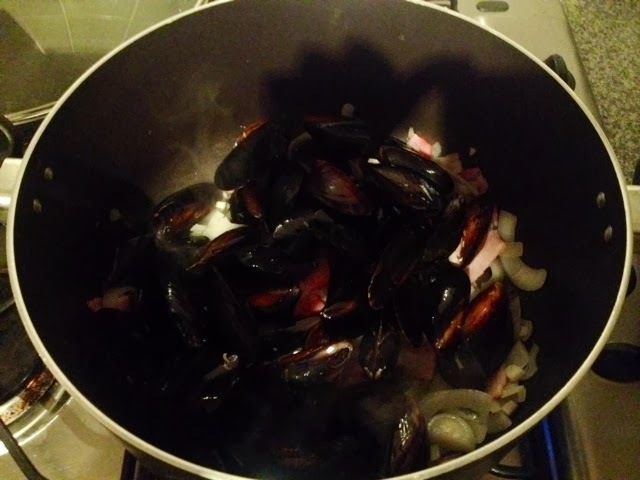 His only criticism was that he wasn’t crazy about the sauce as he prefers stronger, spicier flavours to creamy type things, but the mussels went down well. I’ll just have to work on finding a sauce that he likes now! 1. 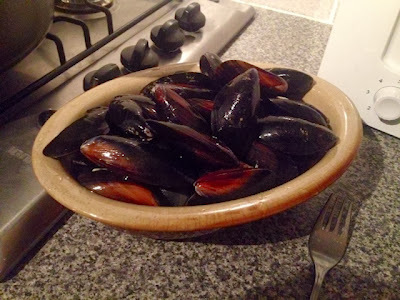 Rinse and check all of your mussels, as detailed above, discarding any that are open or damaged. 2. 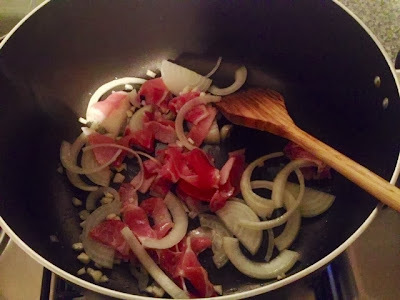 In a very large saucepan gently fry the onions, bacon and garlic until the bacon is cooked and onions are softened. 3. Gently tip in all of the mussels. 4. Pour in the white wine and the cream and throw in the tarragon. Bring to the boil. 5. As soon as the liquid begins to boil, turn down to a gentle simmer and cover the pan with a lid. Simmer for about 3-5 minutes or until all of the mussels have opened up. Season well with salt and pepper. 6. Dish up with plenty of the sauce and bread for mopping up the sauce afterwards.